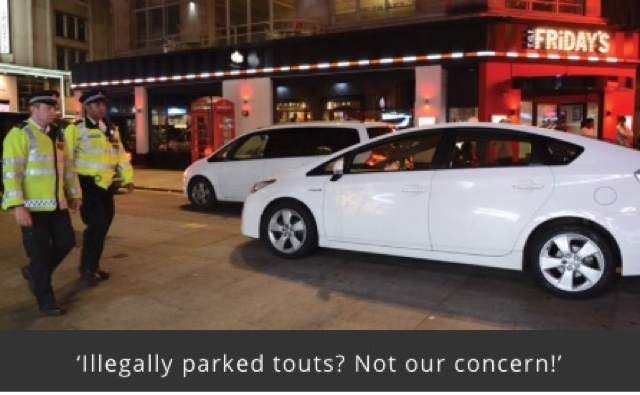 When we had a massive problem with licensed and unlicensed minicabs forming their own ranks outside clubs and bars, because of TfL’s lack of enforcement, drivers took it upon themselves to do something about it. Tiger Tiger and the OnAnon bars were surrounded every night by Minicabs claiming that had the right to rank outside because Dismond Cars held a satilite office licence. Disgruntaled Cabbies felt enough was enough, and so reformed hit squads -groups of vigilante Taxi drivers- which proved to be very effective. As the illegal minicab ranks started to appear outside clubs and bars, hit squads blocked in the touts and took back the work. The militant groups of drivers stopped the work being stolen. Cabbies again formed squads, the most militant being ‘The TaG (Twitter Action Group) Hit Squad. track down illegal drivers and roadblock them, as they seek to preserve their night-time trade. By the end of 2015, we saw the rise of the more organised hit squad (The Mayfair Mob) Their action in itself, saw many more ranks appear. Drivers showed a black cab presence was required outside restaurants and bars such as Hakassan, Nobu, Novikovs, The Arts Club and Forge in the City Of London. But now we have a serious problem that could split the trade in half. A problem that could hasten the demise of our right to ply for hire. AND IT APPEARS THE FIGHT HAS GONE OUT IF THE TRADE. Sitting on Taxi ranks at stations, hotels, bars and restaurants, Cabbies are seeing black cabs (most with livery from Gett or MyTaxi) pull up and spirit away jobs that should be going in the waiting Cabs plying for hire on the rank. We’ve even seen Minicabs working on the same app (Gett) as Taxis! One Taxi garage owner has recently removed Gett livery from all his rental Cabs and the London Cab Drivers Club (LCDC) have refused to carry Gett’s adverts in their Badge publication. But things are starting to come to a head as we are hearing or violent arguments outside bars and restaurants, between ranking drivers and Gett drivers. It has now been bought to our attention that HEATHROW airport are about to introduce a turn up and go service later this summer, to facilitate the increase in app pick ups. Drivers on prebookings from MyTaxi, Gett, Addison Leeand Uber, will be allowed to go straight to terminals to pick up. Again we will be seeing drivers on Taxi apps jumping the queue and taking work away from drivers who have legitimately waited on a rank system. With Taxis already doing 5 hours in the feeder the waiting time for a job could be very much extended.